Salah el-Din is back on 12054.00MHz, pol.H SR:27500 FEC:5/6 SID:262 after a break ( PID:273[MPEG-4]/274 Arabic - Clear). Salah el-Din (Iraq) broadcasts in DVB-S Clear on 11179.00MHz, pol.H SR:27500 FEC:5/6 SID:85 PID:3201/3301 Arabic. A new channel has started in DVB-S Clear: Salah el-Din (Iraq) on 10727.37MHz, pol.H SR:27500 FEC:5/6 SID:4910 PID:4912/4913 Arabic. New frequency for Salah el-Din: 12562.00MHz, pol.H (DVB-S SR:27500 FEC:5/6 SID:519 PID:819/829 Arabic- Clear). A new channel has started in DVB-S Clear: Salah el-Din (Iraq) on 11746.66MHz, pol.V SR:27500 FEC:3/4 SID:110 PID:1010/1210 Arabic. Salah el-Din switched to Eutelsat 3B satellite at 11620.00MHz, pol.H (DVB-S , 11620.00MHz, pol.H SR:27500 FEC:3/4 PID:1020/1022 Arabic). A new channel has started in DVB-S Clear: Salah el-Din (Iraq) on 11470.00MHz, pol.V SR:27500 FEC:3/4 SID:4011 PID:1020/1022 Arabic. New frequency for Salah el-Din: 12360.42MHz, pol.V (DVB-S SR:27500 FEC:3/4 SID:3323 PID:3411/3412 Arabic- Clear). New FEC for Salah el-Din on 11746.66MHz, pol.V: FEC:3/4 ( SR:27500 SID:110 PID:1010/1210 Arabic - Clear). Salah el-Din switched to Nilesat 201 satellite at 11746.66MHz, pol.V (DVB-S , 11746.66MHz, pol.V SR:27500 FEC:5/6 PID:1010/1210 Arabic). New frequency for Salah el-Din: 11430.23MHz, pol.V (DVB-S SR:27500 FEC:5/6 SID:110 PID:1010/1210 Arabic- Clear). New FEC for Salah el-Din on 11747.00MHz, pol.V: FEC:5/6 ( SR:27500 SID:110 PID:1010/1210 Arabic - Clear). 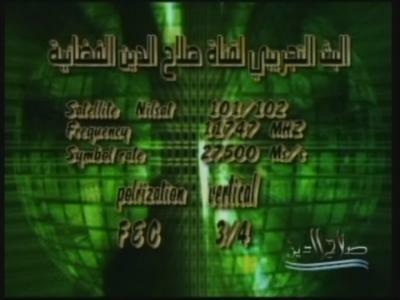 New frequency for Salah el-Din: 11524.00MHz, pol.V (DVB-S SR:2170 FEC:3/4 SID:2 PID:33/36 Arabic- Clear). Salah el-Din is testing in DVB-S Clear on 11490.00MHz, pol.V SR:2170 FEC:3/4 SID:1 PID:308/256 Arabic. Salah el-Din is testing in DVB-S Clear on 11747.00MHz, pol.V SR:27500 FEC:3/4 SID:110 PID:1010/1210 Arabic. A testcard identified Salah el-Din has started in Clear on 11747.00MHz, pol.V SR:27500 FEC:3/4 SID:110 PID:1010/1210.